Old Town, Lansing, MI — The Michigan Trails and Greenways Alliance is proud to support the recognition of philanthropist and trails advocate Mike Levine for his work on Lakelands Trail State Park as the Natural Resources Commission recently honored him by renaming the trail park the Mike Levine Lakelands Trail State Park. Key state and local officials will gather at the Pinckney Depot to celebrate Mike and his passion for trail building at a ceremony this morning. 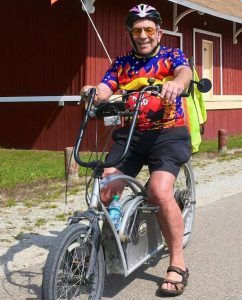 Michigan Trails announced the creation of a new annual award that will commemorate the spirit of trail commitment that Mike has shown us all – The Michigan Trails Mike Levine Annual Trail Volunteer of the Year Award. Every year during trails week in September, Michigan Trails will recognize one individual in this state who has displayed the kind of passion and personal commitment to advancing trails in Michigan that Mike has shown us all. Wilson hopes others are inspired by Mike Levine’s contribution to Michigan’s trails and become more engaged citizen stewards. “This state is a far better place when we can enable and support the kind of citizen stewardship and citizen responsibility that Mike has demonstrated,” explained Wilson.